Eight Dollar Eggs, oil on panel, 6x6"
I’ve been trying to eat a healthier diet and choosing produce and meat that has been sustainably grown. Unfortunately, while the farming may be sustainable, often the prices aren’t. I bought one dozen eggs from a Marin County farm at the local farmers’ market. The vendor explained how the chickens were totally free-range and so got to eat greens and bugs along with their organic vegetarian feed. “In fact,” he bragged as he took my money, “the chickens follow the cows around and eat the maggots from their dung!” Yum! Protein! Despite their fine, buggy diet, these eggs seemed neither fresher nor tastier than the free-range organic eggs I get at Trader Joes for less than half the $8.00 I paid for this dozen. 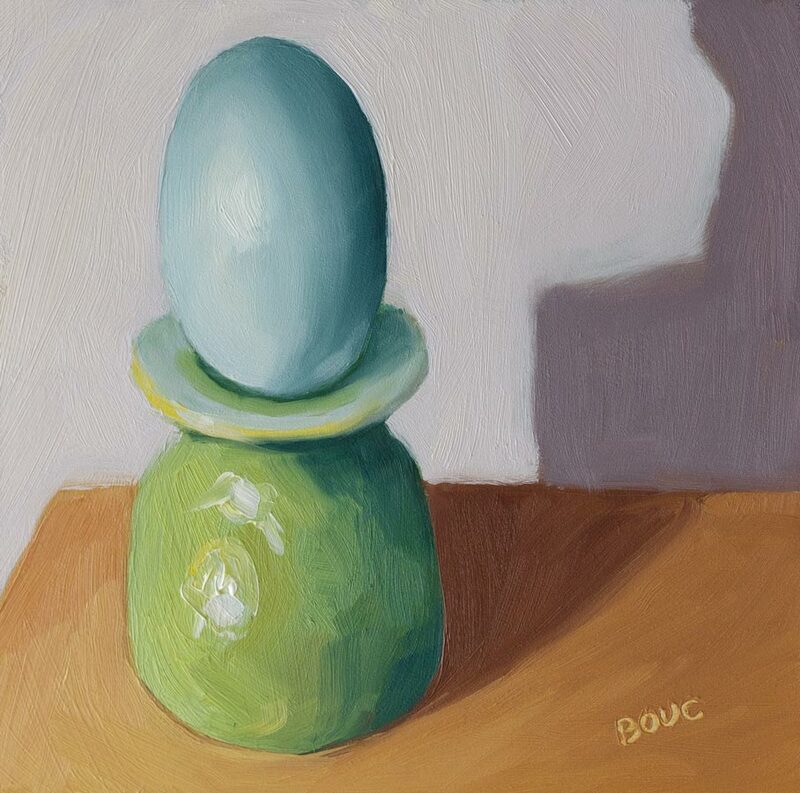 To try to get a little more value out of my investment, I made one of the pretty light blue eggs pose for a still life. I like the way that the lighting coming from below gives the painting a slightly spooky look. Well paying $8 for spooky eggs wouldn’t be so bad. little bistro cost $3.00 and by the way…they are blue! Eight dollars for a dozen? I’d stop eating eggs! Or I’d have to get some chickens and let them eat the bugs in my own yard. Nice painting out of them though! Yeah, definitely not worth $8.00 but raising chickens is not cheap either. I’m back to my $3.00 eggs. For that much money, they shouldn’t just pose for you, they should paint the picture too! But it is a nice color. Haha. That would be cool! I’d love to see that! Aren’t we glad we have Trader Joe’s? Nice painting. Beautiful job with the egg. They are simple but not that easy to paint. Dang! $8/dozen?? I was gasping for breath over the $5/dozen at a farmer’s market in my area (sort of – 25 miles away is the closest). Way to get your money’s worth! Love the gradation of blues in the egg, its perfect shape and smooth smooth edges. I would be afraid of these eggs too if I had paid $8/dozen for them. Your egg is pretty. Ilove the highlight on it. That fellow needs to work on his sales routine — I don’t think the story about the cow dung is a keeper! But at least you got your money’s worth from the eggs. This egg looks like a diva!